Quality landscaping is one-part art, one-part science and one-part hard work. Creativity, knowledge and physical labor combine to make a landscape company. Add in an experienced staff, great customers and 35 years of experience and you have Horizon Landscape & Irrigation. From a complete landscape renovation project to simply adding perennials and a new tree to an existing landscape, Horizon has it covered. Horizon has the experience and the staff to complete your landscape wishes. Horizon Landscape & Irrigation is dedicated to providing our customers both quality landscaping and great customer service. We value our customers, both residential and commercial, and their desires to make their outdoor spaces unique outdoor environments. Working together to accomplish our client’s vision is what makes us ready to accept the next exciting project. 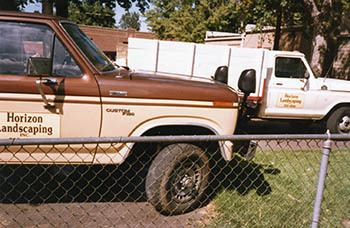 Our mission is to provide our customers with both quality landscaping along with excellent customer service. Horizon Landscape & Irrigation is a full-service landscape construction and commercial maintenance company. Bruce VanDenBerg, company founder and president, began Horizon Landscape & Irrigation in 1983. The business began as a one-man operation that Bruce ran out of his home. As he gradually built a loyal clientele, he has added staff and expanded the services the company offers. Bruce’s wife Carla officially joined Horizon in 1998 as vice-president and office manager. Although the business has grown, Horizon is still family owned and operated. Horizon Landscape & Irrigation is fortunate to have experienced and knowledgeable staff with combined experience of over 120 years. Our staff is qualified to meet your individual needs from renovating small residential yards to site planning for all sized projects.